This easy recipe for warm shrimp and blue cheese pasta salad combines three of your favorite ingredients in one easy to make dinner! So, one day I was surveying my fridge and freezer and I figured out I had the following random conglomeration of things: asparagus, a bag of frozen shrimp and a nice hunk of blue cheese. And of course, I’m never without a whole variety of different varieties of pasta in the cupboard. There was something there…was it a pasta salad? It was, but since I wanted the blue cheese to be a little melty so that it could hold the whole thing together, it was a WARM pasta salad. Warm shrimp and blue cheese pasta salad. Could it work? I started with a big old pot of boiling water, and cooked up the shrimp, and then scooped them up and popped them into a bowl of cold water to cool them down. Next into the pot was a bunch of asparagus, sliced into bite-sized pieces and cooked just until they were crisp-tender. Also scooped out and dunked into cold water. This easy recipe for warm shrimp and blue cheese pasta salad combines three of your favorite ingredients in one easy to make dinner! #recipeClick to TweetNow my boiling water was a little bit shrimpy, a little bit asparagusy, and ready for the pasta! You can use any kind of short pasta you have on hand…ziti, penne, rotini….anything that has some holes or ridges to hold the sauce. While your pasta is cooking, let’s make that sauce! Saute a little garlic in some olive oil…use a nice big skillet because we’re ultimately going to toss everything into it. Once the garlic has sizzled for about a minute, add in a little cream and some crumbled blue cheese and stir it around until it is all melted and wonderful. Now turn off the heat and add the pasta, the shrimp and the asparagus. Toss it all around gently and add a little bit of salt and pepper to taste. 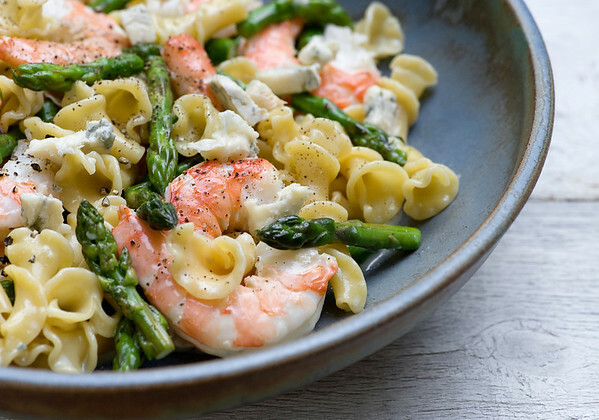 The cool shrimp and asparagus are going to mix with the warm sauce and pasta to make the whole thing somewhere between room temperature and just a little warm….voila, warm shrimp and blue cheese pasta salad! It’s amazing what a few minutes of staring into your refrigerator can do for your supper table! Bring a large pot of water to boil and salt generously. Add shrimp and cook until pink, about 3 minutes. Scoop out shrimp and cool in a bowl of cold water. Peel and set aside. Add asparagus to the same pot of boiling water and cook until crisp-tender, about 1-2 minutes depending on the thickness of the asparagus. Scoop out and cool in cold water. Drain and set aside. Add pasta to the same pot and cook according to package directions. Drain well and set aside. Add oil and garlic to large skillet and cook garlic over medium high heat for one minute. Add cream and blue cheese and stir until cheese is melted. Remove from heat. Add shrimp, asparagus and pasta to skillet and toss until coated with sauce. Season to taste with salt and pepper, garnish with additional crumbled blue cheese and serve. wow that dinner looks awesome! My fiance would love it! PINNED! My Mister would love this dish! I never buy shrimp frozen, can you recommend a bagged product that is good and tell me where to get it? Thanks! Hi Lauren! I buy my shrimp pretty exclusively at Costco. I don’t know how they do it, but their shrimp are INCREDIBLY good all the time. I was lured to this site by the luscious triple decker cheesecake, then I saw the ham & red eye gravy, then the ice box pickles (com’on, a suthren husband’s gotta know that there ain’t no such thing as a Refrigerator Pickle, whether he eats them or not). Anyway, now I can’t leave. This pasta has to be sampled immediately.